The cutting process of diamonds takes huge skill and expertise as it can hugely impact the beauty of the stone and increase its price massively. Here is one of our diamond cutting team in Antwerp who sometimes custom cut stones for us. 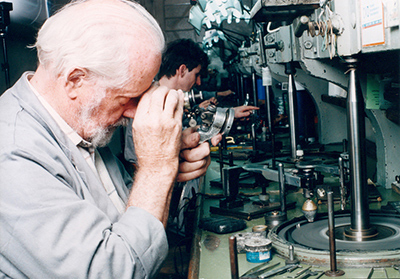 This is where the cut designer decides what stone or stones to get out of one piece of rough diamond. For large stones this is often now done with the help of CAD but more often than not for more usual sizes stones this is done by eye. The 'art' of splitting the stone along a cleavage plane. You may have heard stories of diamond cutters fainting before cleaving hugely valuable stones like the Cullinen diamond! Cleaving is a quick way to start to cut a diamond but a risky one...rather like tearing a piece of paper after folding it, sometimes it works and sometimes it doesn’t – which can be an expensive mistake. Nowadays it's more common for diamonds to be initially cut with saws or lasers and then more finely cut using these same tools. Is where the basic rough shape is put into place with saws and discs. 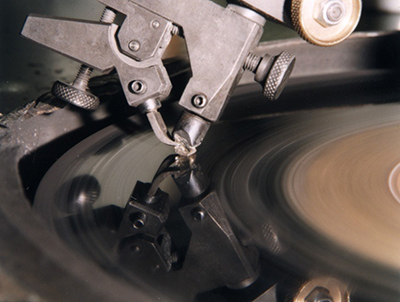 This is where discs are used to put the basic initial facets into place. The final process which involves putting the final finishes to the facets. So in all there are 6 simple steps and every single one can affect the look and price of a stone enormously. Each of these areas is really an art form in its own right. If you were lucky enough to catch the BBC programme 'Hidden Treasure' on TV recently, then you would have seen how CAD (computer aided design) is being used on large stones to determine the design of cut, they also showed some of the cutters working on stones with discs like this. 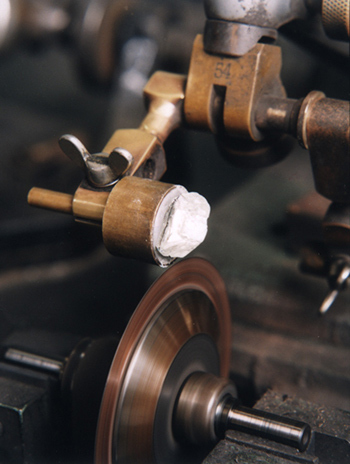 Sometimes people ask us if we at Harriet Kelsall cut stones ourselves; we do sometimes get stones cut for our customers using our lapidurists (or stone cutters) but this is a very different craft to what we do here making jewellery. An analogy would be that cutting stones compared to making bespoke jewellery is like the difference between weaving fine cloth and being a couture dress-maker....A couture dress maker needs to know a lot about cloth – what is good and how to use each type to its best advantage...and may be able to get bespoke cloth woven for a customer...but they don’t do the actual weaving themselves as this is a completely different speciality. What we are always looking for when we examine the cut of a diamond to determine its quality is a combination of three things in fine balance; Brilliance – the return of white light to the eye, Dispersion – 'fire' flashes of rainbow colours and Scintillation – sparkle and flashes of light with movement.